Columbus LT Built-In Power BI Reports helps to analyze and monitor data collected with Microsoft Dynamics NAV or AX. Designed to be easy to use and manage, they are built on Microsoft SQL Server, to provide you with the necessary analytical, data mining, and reporting capabilities. With 19 ready to use reports we offer our best-practice to help you explore data in main business areas: sales, purchases, general ledger and inventory. Sales: sales reports help to track sales, compare it with last year situation, analyze sales persons results or monitor unpaid customers amounts. For your business insights we offer these reports: Sales analysis, Comparative sales analysis, Customer/Sales Person/Product statics, Sales returns, Customer debts (current and to date). Purchases: purchases reports help to take decisions related to long-term relationship with vendors and helps to increase negotiation power. For your business insights we offer these reports: Purchase analysis, Comparative purchase analysis, Vendor/Product statics, Purchase returns, Debts to vendors (current and to date). General Ledger: financial reports help to follow balance between income and expenses, compare financial results quarterly or track budget fulfillment. For your business insights we offer these reports: General ledger analysis, GL comparing to last year, Budget vs. Fact. Inventory: inventory reports help to keep optimal stock level and inventory turns. For your business insights we offer these reports: Product expiration, Inventory in stock, Inventory aging, Inventory turnover. 1. Log in to Power BI at https://app.powerbi.com/groups/me/apps. 2. Click “Apps” tab on the left and then click yellow “Get Apps” button. 3. Search for “Columbus” and select “Apps” results tab. 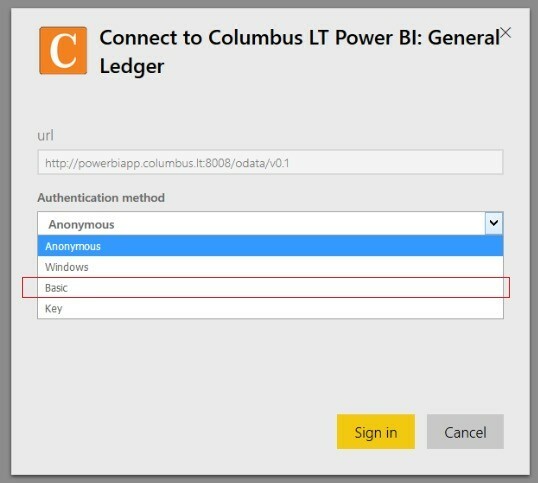 When you see the Columbus LT Power BI solution listing, click “Get It Now” button. Columbus LT Power BI solution Content Pack use demo data. If you are interested to integrate your company data, which is collected with Microsoft Dynamics NAV or AX, please contact us.